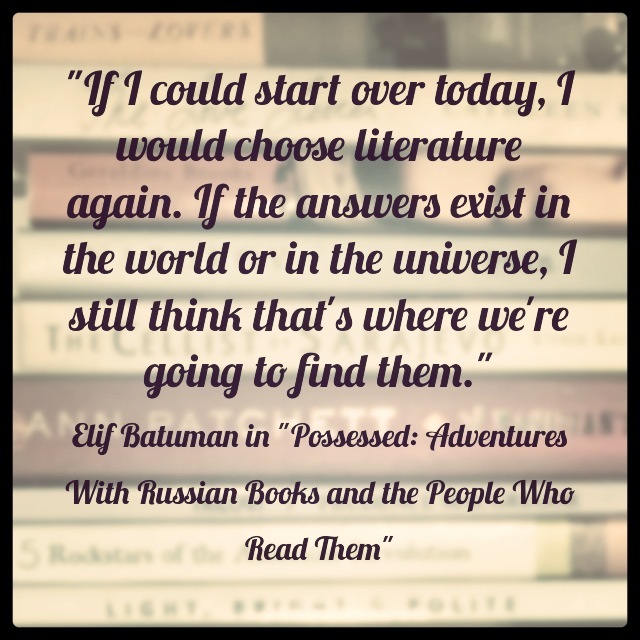 The pictured quote is the last line in Elif Batuman’s memoir “Possessed: Adventures With Russian Books and the People Who Read Them.” Her smart, funny, moving, melancholy book melds literary journalism and analysis with deeply revealing personal stories. Batuman writes about classic Russian authors (Tolstoy, Pushkin, Dostoyevsky) in a way that’s familiar to me from my own days as a graduate student. Literary theory stalwart Michel Foucault makes an appearance. There is history, analysis. At times, I wondered if non-academic audiences would relate to her references (every subculture has its own vocabulary, after all). To enjoy her book, though, a reader doesn’t need to catch every reference because her writing is so lit from within by her obvious passion for her subject that it pulls readers into the tide with her. Her chapter on Tolstoy, in particular, is brilliantly evocative. It turns out I wondered for nothing—her memoir was a bestseller. Woven through her literary discussions are portraits of academic life that quietly echo the kind of wry observations and pathos-filled characters you might find in some of the Russian classics Batuman discusses. Those classics inform her and reveal her to herself. Her exquisitely crafted scenes include a summer spent studying in Uzbekistan, an Isaac Babel conference, and her pilgrimage to St. Petersburg. Wherever she takes you, Batuman reveals her awareness of the absurd and of beauty and of their cohabitation. Underlying it all is her deep faith in and love for literature. Part of the brilliance of this quote, in particular, is that it expresses precisely why so many of us value literature, whether we’re reading it on a stiff metal chair in a dusty classroom or on a beach chair by the ocean.